Guests of the Euro Hôtel Orly Rungis can relax in the hotel's bar and enjoy buffet meals in the restaurant. The Euro Hôtel Orly Rung also has a business centre and provides a regular airport shuttle bus. The Orly Rungis is 12 kilometres from central Paris and is located at the intersection of the A6 and A86 motorways, offering fast road access to Disneyland Resort® Paris. The hotel is located between Paris, Disneyland and Versailles, in the middle of the Parc Médicis de Fresnes and offers comfortable accommodation. To access the hotel from Orly Airport, take the 285 bus in the direction of Villejuif-louis Aragon and get off at Le Cor de Chasse-Belle Epine. Then, take the TVM in the direction of La Croix de Berny and get off at Parc Médicis. Please contact the hotel in advance for airport shuttle times and details. Charges may be applicable. Please note that the parking costs EUR 5 per night for guests don't sleep at the hotel. The shuttle service from the airport is available at extra cost for guests don't have a reservation at the hotel. This air-conditioned room features free Wi-Fi, a flat-screen TV with satellite channels and an en suite bathroom. Extras include a seating area. 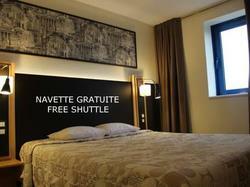 This air-conditioned room features free Wi-Fi, a flat-screen TV with satellite channels and an en suite bathroom.